On November 14, the U.S. Bureau of Economic Analysis served up its latest estimate on real economic growth in the states. 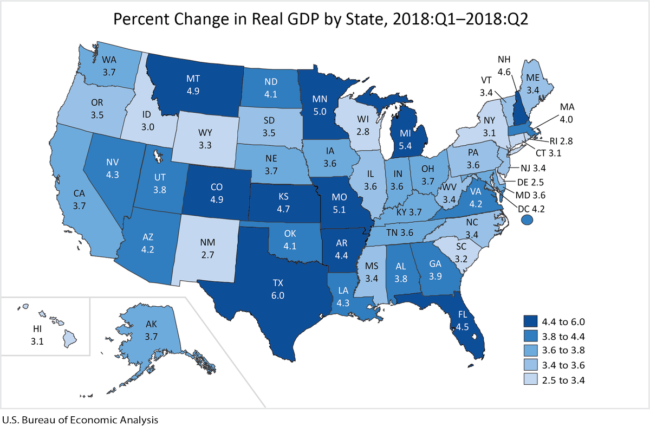 U.S. real GDP grew at a strong 4.2 percent in the second quarter of 2018, and looking at the data from the 50 states, the news was good across the nation. In fact, the state with the slowest real GDP growth in the second quarter was Delaware at a respectable 2.5 percent. It’s also notable that 15 states saw their economies shrink in the first quarter, and each one flipped to respectable or solid growth in the second quarter. Let’s take a moment to look at the four most populous states in the nation – California, Texas, Florida and New York. These states are also noteworthy for their very different public policy climates for entrepreneurship, business and investment. Consider that on the Small Business Policy Index 2018: Ranking the States on Policy Measures and Costs Impacting Small Business and Entrepreneurship, California and New York rank miserably – 50th and 47th, respectively – while Taxes and Florida rank among the best states – coming in second and fifth, respectively. The Index offers the most comprehensive comparison of the states in terms of policy decisions affecting the economy. Of the 55 measures included in the 2018 edition of the Index, 27 are taxes or tax related, 20 relate to rules and regulations, 5 deal with government spending and debt issues, with the 3 remaining measures gauging the effectiveness of important government undertakings. It’s noteworthy that during the first two quarters of 2018, economic growth in California and New York under-performed the nation at large, while Texas and Florida outperformed. Consider that in the first quarter 2018, the U.S. economy grew at 2.2 percent. California’s growth rate registered only 1.6 percent and New York’s was a woeful 0.3 percent. However, Texas grew at 2.7 percent and Florida at 4.3 percent. And in the second quarter 2018, while the U.S. economy expanded by 4.2 percent, growth in California came in at 3.7 percent, in New York at 3.1 percent, in Florida at 4.5 percent and in Texas at 6.0 percent, which was the fastest growth rate among the 50 states. Yes, policies that impact entrepreneurship, business and investment matter when it comes to economic growth.